The teaching materials for the learning experience on “Priesthood and Priesthood Keys” are divided into four parts. Part 4 includes a practice exercise that will help students apply the doctrine they learned from the Doctrinal Mastery Core Document along with the doctrinal mastery scripture passage in Doctrine and Covenants 42:11. 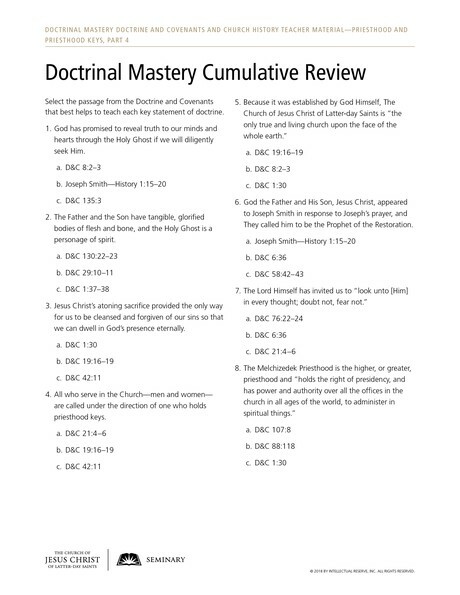 This lesson also contains a cumulative review of all the doctrinal mastery passages students have studied so far this school year. Note: You could teach this lesson in a single class session or in two different class sessions. If you choose to teach the segments over the course of two class sessions, you may need to briefly review with students what they learned in previous segments before you teach a new segment. Monika has never felt unloved or unappreciated at church. She has been taught that she has a divine nature and individual worth. She has observed powerful Young Women leaders and a wonderful mother who happily serve in the Church and in their communities. But Monika is unsure how to answer the question. In fact, it starts to bother her, and she begins to wonder why women don’t hold certain positions in the Church. The argument she heard about equality and fairness for men and women begins to sound reasonable to her. One day in seminary Monika writes a note to her seminary teacher, Sister Bell, asking, “When will the Church be like everyone else and start treating men and women equally?” The following day, Sister Bell decides to address the question in class. She asks how a person with this question might act in faith. Students discuss things such as the importance of praying to Heavenly Father for help and understanding. One student expresses the importance of holding on to what they already understand about their relationship with Heavenly Father and shares an example of when she came to know that Heavenly Father loves her and values her. How could the comments by Monika’s classmates help her act in faith? What other suggestions do you have for how a person with this question might act in faith? To help the class consider how they might examine the question with an eternal perspective, Sister Bell encourages them to think about the worldly assumption or premise upon which the question is based. She asks, “How might the world define equality and fairness?” A few students comment on how some people think that equality and fairness mean that everything must be the same between men and women. A young man explains that according to the world, a person’s position determines his or her importance, and that could lead to the perspective that some Church callings are more valued than others, making it seem unfair if everyone can’t hold those callings. Can you think of any other worldly assumptions or premises that could influence how some people might view callings or positions in the Church? Sister Bell thanks the students for their insights and reminds them that the Savior does not view callings and leadership as the world does. She points out that the scriptures teach that “the eye cannot say unto the hand, I have no need of thee” (1 Corinthians 12:21) but that all members are an integral part of the same body and that all are needed and have an opportunity to serve. Then Sister Bell asks, “During His mortal ministry, how did the Savior show that He loved and valued women?” With the help of their teacher, the students think of examples, like the way He treated His mother, the Samaritan woman at the well, and Mary Magdalene. They also remember miracles that He performed that blessed and healed women. To help her students seek further understanding through divinely appointed sources, Sister Bell encourages her students to search their memories for helpful scripture references and talks from Church leaders that relate to this question. They identify resources such as “The Family: A Proclamation to the World” and the Gospel Topics Essays. One particular talk is suggested that catches Monika’s attention. It is a talk by Sister Linda K. Burton called “We’ll Ascend Together” from the April 2015 general conference. Sister Bell also suggests a talk given by President Russell M. Nelson called “A Plea to My Sisters” from the October 2015 general conference. Monika makes a note of these in her study journal and decides to study them later. Can you think of any additional divinely appointed sources that might help someone with Monika’s question? The discussion ends with Sister Bell sharing her testimony that all who serve in the Church—men and women—are called under the direction of one who holds priesthood keys, and she reminds them that this truth is found in Doctrine and Covenants 42:11. She also reminds her students that “whoever functions in an office or calling received from one who holds priesthood keys exercises priesthood authority in performing her or his assigned duties” (Dallin H. Oaks, “The Keys and Authority of the Priesthood,” Ensign or Liahona, May 2014, 51). She also reminds her students of the doctrinal mastery scripture passage that says “The Lord … doeth that which is good among the children of men; … and he inviteth them all to come unto him and partake of his goodness; and he denieth none that come unto him, black and white, bond and free, male and female; … all are alike unto God” (2 Nephi 26:33; italics added). Sister Bell encourages her students to continue to prayerfully study this question and invites them to bring to class what they learn. What did you learn from this scenario about Monika’s question? 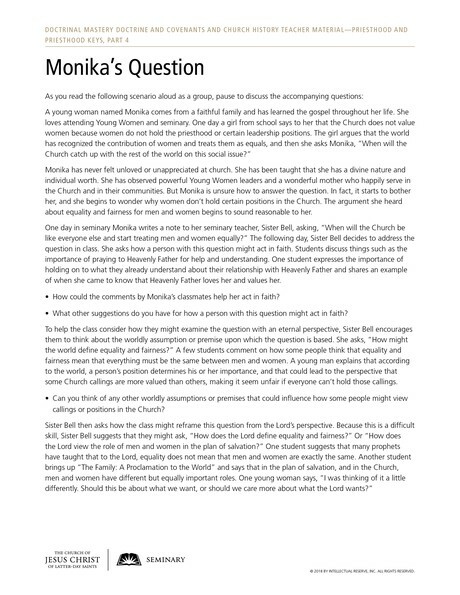 After students have finished reading the handout and discussing the questions in their groups, invite them to share any thoughts, questions, or feelings they have as a result of the practice exercise—whether about Monika’s question or about acquiring spiritual knowledge in general. Testify that Heavenly Father loves all of His children and that everyone who serves in the Church is “called under the direction of one who holds priesthood keys,” “exercises priesthood authority in performing her or his duties,” and is an important part of the kingdom of God. The accompanying quiz can help you assess how familiar students are with the key statements of doctrine and the doctrinal mastery scripture passages presented so far this school year. Before you administer the quiz, you may want to give students time to study the doctrinal mastery passages and statements of doctrine. Reduce the number of questions if there is not enough class time remaining to administer the complete quiz. Select the passage from the Doctrine and Covenants that best helps to teach each key statement of doctrine. God has promised to reveal truth to our minds and hearts through the Holy Ghost if we will diligently seek Him. The Father and the Son have tangible, glorified bodies of flesh and bone, and the Holy Ghost is a personage of spirit. Jesus Christ’s atoning sacrifice provided the only way for us to be cleansed and forgiven of our sins so that we can dwell in God’s presence eternally. God the Father and His Son, Jesus Christ, appeared to Joseph Smith in response to Joseph’s prayer, and They called him to be the Prophet of the Restoration. As the Prophet of the Restoration, Joseph Smith translated the Book of Mormon by the gift and power of God. Repentance includes recognizing our sins; feeling remorse, or godly sorrow, for committing sin; confessing our sins to Heavenly Father and, if necessary, to others; forsaking sin; seeking to restore, as far as possible, all that has been damaged as a result of our sins; and living a life of obedience to God’s commandments. Jesus Christ created the heavens and the earth under the direction of the Father. A prophet is a person who has been called by God to speak for Him. If we faithfully receive and obey the teachings of the President of the Church, God will bless us to overcome deception and evil. Jesus Christ’s sacrifice benefits each of us and demonstrates the infinite worth of each and every one of Heavenly Father’s children. Jesus Christ will come again in power and glory and will reign on the earth during the Millennium. Answers to the quiz: 1. a; 2. a; 3. b; 4. c; 5. c; 6. a; 7. b; 8. a; 9. b; 10. b; 11. b; 12. c; 13. c; 14. a; 15. b; 16. c; 17. c; 18. b.